Future of Web Development : AnuglarJs + REST API ? It's a paradigm shift in web development. Unlike the days we used to develop web apps using classic Asp, Asp.Net or Php, the focus has changed into decoupling the frontend and backend. More and more web apps are adapting this methodology mainly due the evolution of mobile usage. With mobile & tablets revolution, developers are constantly finding ways to develop a single app to support all of the different devices and their browser sizes. It has been always difficult and costly to develop native apps for various different mobile platforms. Although the responsive design was the solution, it is extremely hard to avoid unnecessary page reloads while using the web app on mobile devices. The basics of AngularJs + API driven Web app. This should be the preferred approach for any new web application development. However for the apps which are monolith or legacy could still gain the benefits by modularizing the APIs as shown in the following example. 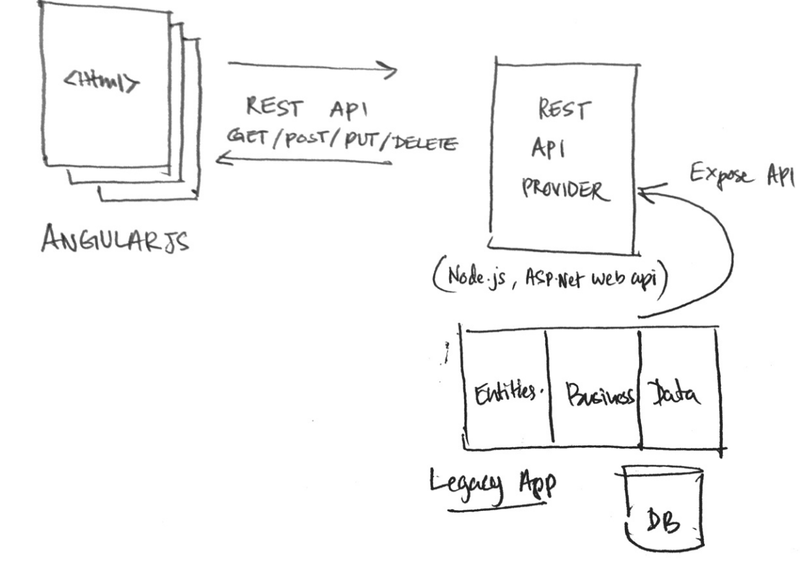 For example, some parts of the apps can be decoupled using an API layer on top of the legacy/monolith web application. One of the best approaches to write a scalable backend API is by using micro-services architecture, which will be discussed in my next post. Writing scalable & high performance web applications have been a challenge, by making it device agnostic is even challenging. It is evident that AngujarJs + APIs solve the challenging nature of web apps to support multiple devices and increase the performance.